When prostate cancer metastasizes to bone, it can become especially dangerous – not only with its action in the bone but, interestingly, with increased aggressiveness of the overall cancer itself. Now, research presented at the American Association for Cancer Research (AACR) Annual Meeting 2018 hints at why: Cells involved in these bone metastases may release signals that drive the progression of the disease. "With prostate cancer, often a patient will come in with new bone growth, which can be really painful. What we show is that some of the same things that cause this new bone growth may help the cancer grow and spread," says Philip Owens, PhD, investigator at the University of Colorado Cancer Center and Denver Veterans Administration Hospital Research Program. Specifically, Owens looked at growth factors called bone morphogenetic proteins (BMPs). As the name implies, BMPs aid the growth of healthy bone – and are even used to grow new bone in procedures like spinal fusion. But mutations that dysregulate BMP – both turning up or turning down its activity – have been implicated in many cancer types. For example, low BMP signaling seems to drive some colorectal cancers, while high BMP signaling is associated with esophageal cancer. Owens explored BMP signaling in a special kind of cell found in bone and bone marrow known as myeloid cells. These cells are multipotent, able to differentiate into new cell types that form components of bone and blood, especially cell types of the immune system. The current study knocked out the gene BMPR1a, one of these BMPs, specifically in myeloid cells. Mouse models of prostate cancer in which BMPR1a was removed formed fewer, smaller tumors than mice with active BMPR1a. Specifically, it seemed that conditional deletion of BMPR1a removed some of these myeloid cells' stem-like abilities, restricting the kinds of cells they could produce (and in turn, restricting the ability of myeloid cells to drive cancer). The team had previously shown that the experimental BMP inhibitor, DMH1, had dampened the growth of cancer cells and Owens calls the current study "genetic proof" showing not only that the drug happens to work, but also showing how the drug likely works in cells that are not the tumor themselves. "We think there's evidence that in many tissues, the BMP that is driving cancer is in fact coming from these myeloid cells. This is an emerging body of evidence showing the anti-cancer benefit of inhibiting BMP signaling in myeloid cells," Owens says. 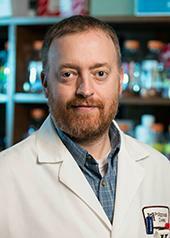 Owens' continuing work at CU Cancer Center, CU School of Medicine and Denver VA Hospital hopes to continue making the case for BMP inhibition in myeloid cells as a component of prostate cancer treatment, possibly leading to a human trial of this strategy with DMH1 or another BMP inhibitor for patients with metastatic disease.